بهبهانی, حمید, افندی‌زاده, شهریار, رحیم‌اف, کامران. (1387). تحلیل زمان انتظار مسافران در ایستگاه‌های مترو با استفاده از تکنیک شبیه‌سازی (مطالعه موردی متروی تهران). پژوهشنامه حمل و نقل, 5(1), -. 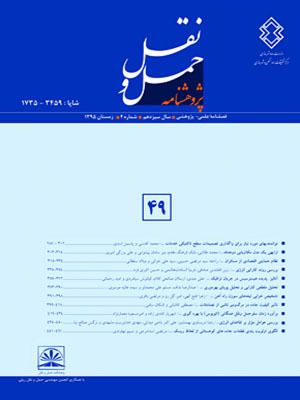 حمید بهبهانی; شهریار افندی‌زاده; کامران رحیم‌اف. "تحلیل زمان انتظار مسافران در ایستگاه‌های مترو با استفاده از تکنیک شبیه‌سازی (مطالعه موردی متروی تهران)". پژوهشنامه حمل و نقل, 5, 1, 1387, -. بهبهانی, حمید, افندی‌زاده, شهریار, رحیم‌اف, کامران. (1387). 'تحلیل زمان انتظار مسافران در ایستگاه‌های مترو با استفاده از تکنیک شبیه‌سازی (مطالعه موردی متروی تهران)', پژوهشنامه حمل و نقل, 5(1), pp. -. بهبهانی, حمید, افندی‌زاده, شهریار, رحیم‌اف, کامران. تحلیل زمان انتظار مسافران در ایستگاه‌های مترو با استفاده از تکنیک شبیه‌سازی (مطالعه موردی متروی تهران). پژوهشنامه حمل و نقل, 1387; 5(1): -. موضوع میانگین سر فاصله زمانی اعزام قطارها یکی از مهم ترین شاخص‌های اثر گذار بر زمان انتظار مسافران است. برای ایجاد تناسب منطقی در خدمات‌دهی سیستم‌های همگانی باید نرخ سرویس‌گیری مسافران از سیستم با نرخ ورود آنها هماهنگ شود. در این مقاله بر مبنای شاخص‌های شناسایی شده اثر گذار بر زمان انتظار مسافران در محیط مطالعات موردی شبکه مترو تهران، اقدام به بررسی‌های میدانی و آمارگیری از حجم مسافران ورودی، زمان پیاده روی از محل ورود به ایستگاه تا روی سکو، زمان انتظار برای سوار شدن به قطار، فاصله بین ورود قطار‌ها به ایستگاه و غیره.... از سیستم مترو شده است و سپس با توجه به فرآیند مدل‌سازی شاخص‌ها، نحوه عملکرد و بهره برداری سیستم مترو تهران برای دوره زمانی 6 الی 10 صبح ( اوج صبحگاهی یک روز میان هفته) شبیه‌سازی شده و در ادامه با مقایسه داده‌های حاصل از عملیات میدانی آمارگیری و خروجی‌های شبیه‌سازی، اقدام به تعیین اعتبار مدل و بررسی صحت مدل شده است.با توجه به مدل شبیه‌سازی طراحی شده و انجام فرآیندهای مدل‌سازی شاخص‌ها و کالیبراسیون آن، رابطه ریاضی بین زمان انتظار مسافران در ایستگاه‌ها با سر فاصله زمانی اعزام بین قطارها در شرایط مختلف به تعداد خطوط مترو و به تفکیک مسیرهای رفت و برگشت به دست آمد. بر مبنای فرآیندهای اعتبارسنجی، حداقل انطباق خروجی‌های مدل شبیه‌سازی با نمونه‌برداری آماری انجام شده با دقت 95% حاصل شد و نسبت زمان انتظار به سر فاصله زمانی قطارها به‌طور میانگین برای طول دوره زمانی شبیه‌سازی در کل شبکه به میزان 6/0 مشخص شد. 1Professor, Department of Civil Engineering, Iran University of Science and Technology, Tehran, Iran. With the increasing demand for public transportation due to congested city highways and streets, the rail systems and especially metro have become one of the most viable alternatives for daily commuting. While city planners are excited with the increasing public transportation ridership, they are also challenged with a higher volume of passenger flow and longer queuing lines at the existing stations and of course, metro platforms.One of the most useful features for improvement of the current situation and plans for the future, is using simulation tools to help the planner to evaluate system operation design, queue management, fare equipment design and fare policy impacts, all in virtual and real world. In this study, co- ordination of headways between entrance of passengers to metro station, and arrival of metro trains that travel by fixed scheduling is proposed. The objectives for the study are development a simulation model to analyze the passenger waiting time of urban metro stations with other modes of feeder services. Urban metro system is characterized by its comparatively short headway and fixed schedules. Thus, the behavior of passengers in urban metro is significantly different from the behavior of passengers in intercity train or bus system. If the entrance of passengers from other modes likes buses, taxies, walking and etc. To metro station considered as a major feeder system for the urban metro, passenger waiting time and related behaviors of the urban metro station should be influenced by the reliability of train scheduling that the most important part is average headway between arrival of each metro trains.So, in this study by using simulation technique, a reliable simulation model for passenger and metro train that named as "METSIM Software", where designed.Results provide planners with an analytic model for accurately quantifying the relation between passenger waiting time of urban metro system and the reliability of other variables like headway of arrival metro trains due to fixed scheduling, passenger flow entrance rate from other feeder services to the station, fare policy and the equipment that presented at ticket hall for fare collection (like ticket vending machine, waiting in queue lines for buying paper tickets or credit cards, and ticket acceptance gates). By using statistical data collected fully one normal day from three lines and 30 stations of Tehran metro and running the program of simulation model for four hours (6:00 to 10:00 AM) of a normal day, the Mathematical Relations between passenger waiting time of the stations (w) and Average headway of trains (h) where dedicated and the ratio between these two parameters as an average of the simulation run time is determined by 0.6 in accuracy of 0.95 percent for the total Tehran metro network.